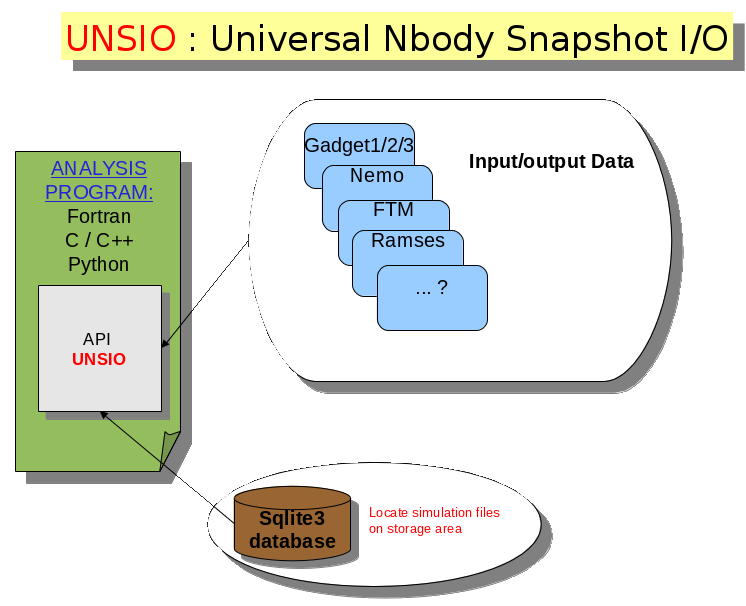 UNSIO ( U niversal N body S napshot I nput O utput) is an API which perform input/output operations in a generic way, and on different kind of nbody files format. By using this API, a user could write only one analysis program which will work on all known files format supported by UNSIO. It's not necessary anymore to know how is implemented a file format, UNSIO will do transparently and automatically all the hard work for you ! With UNSIO, you will spend less time to develop your analysis program. UNSIO comes with an integrated sqlite3 database which can be used to retrieve automatically all your data among terabytes of hard disks. Unsio is under heavy development. You can download it via GIT repository or by direct daily snapshot download. User guide, follow the link.